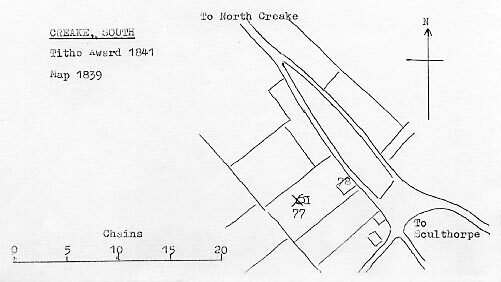 South Creake Beck Street postmill had a roundhouse and used one pair of common sails and one pair of patent sails to drive 2 pairs of French burr stones and a flour mill. One pair of stones were 4ft 8ins in diameter and a smaller pair were 3ft 8ins in diameter. The bake office had a 30 stone oven and a horse mill was also used on the site. Wiliam Shackcloth was survived by his brother Thomas, a shepherd, who made a will in 1816, which named John Oliver as an executor. 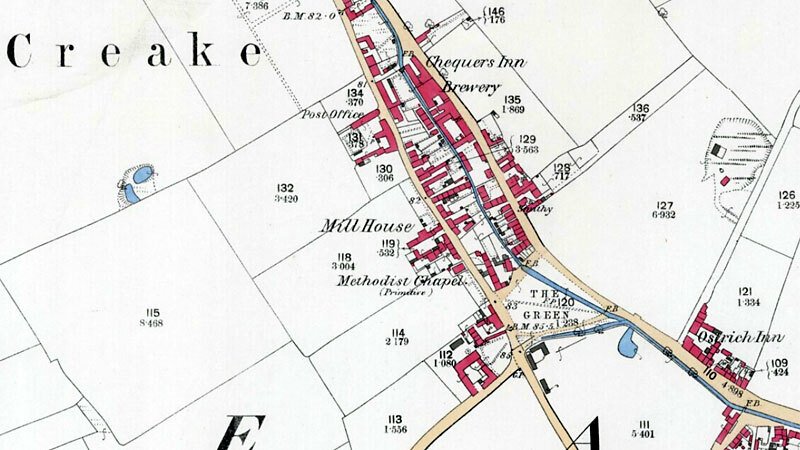 He left his eldest son, William, (b.1871) his freehold property consisting of a cottage situated within a yard in South Creake ..now in the occupation of Thomas Shackcloth, Miller. William Shackcloth married Elizabeth Tuck and became the publican of the Fleece Inn. In 2007 a Fleece House, was still situatesd in Back Street, South Creake. In 1818, the Norfolk Chronicle published a report of a theft at Thomas Shackcloth's Mill in South Creake after the case was heard at Norfolk Assizes on14th March 1818. A Capital POST WINDMILL with two pair of French stones, roundhouse, commodious granaries & horse mill for dressing flour, baking office & thirty stone oven, with convenient outhouses adjoining, a large dwelling house & between 3 & 4 acres of good Land. The whole of the premises are in good repair & well calculated for carrying on an extensive business. South Creake is situated about 6 miles from Fakenham, 7 from the Port of Wells, 6 from Burnham Overy & 8 from Brancaster. Apply (if by letter post paid) to Mr. Thomas Shackcloth, Miller, on the premises. A good Dwelling house in South Creake with a Post Corn Windmill, Horse Mill, Baking Office & other Buildings, Yard & Garden & about 3 acres of Arable Land in a high state of cultivation. These Premises are situate in the centre of the town where a very excellent Retail Trade is carried on. Possession may be had at Michaelmas next. Apply to Mr. Robert John Oliver of South Creake or at the office of Mr. Cates, Fakenham. Susannah Shackcloth, listed as the mill owner in the Tithe Award of 1841 was possibly the Susannah Rebecca Shackcloth b.1817, daughter of William & Mary Shackcloth, William being the younger brother of Thomas Shackcloth, miller. The Interest of the Mortgagee in an Estate at South Creake consisting of a Dwelling House, Baking Office, Stable, Gig house, Granary & other buildings, POST CORN WINDMILL with Roundhouse, Horse Mill, Yards, Garden & about 3 acres of Land adjoining, in the occupation of Mr. Charles Wright (who quits at Michaelmas next) at the yearly rent of £42. With the above Premises will also be sold the Interest of the said Mortgagee in an Allotment of Land containing 1a. 1r. 8p. lately awarded in respect thereof under the South Creake Inclosure. Apply to Mr. Campbell, Solr. Fakenham. Apply to Mr. Campbell, Solr., or the Auctioneer, Fakenham. Mr. R. Spicer will Sell by Auction at the Chequers Inn, South Creake on Tuesday November 13, 1866 all the substantial Post WINDMILL with 2 Patent & 2 Common Sails, driving 2 pairs of Stones 4 ft. 8 in. & 3 ft. 8 in. with Flour Mill attached, with Straps & Chains & Brick Round House, capable of doing an extensive Trade being well buit & strong timbers. Sale to commence at 6 p.m. I have been trying to find information regarding the death and will of Thomas Shackcloth, which would appear to have occurred between 1825 & 1841, without success so far. I'm really intriqued to know why he left the Mill to his niece rather than his son..